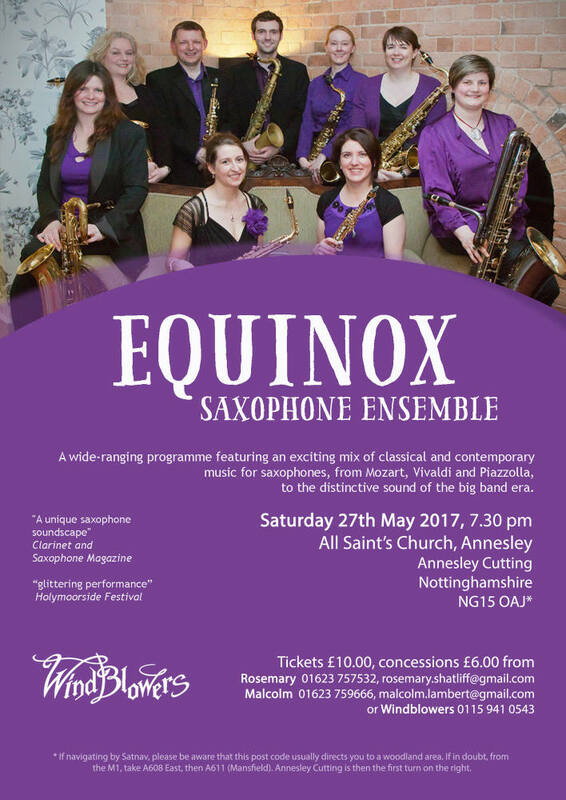 Equinox present the many voices of the saxophone with their unique combination of instruments from the saxophone family – and beyond. The nine players perform on a range of instruments to showcase many different ways to create a stunning range of sounds and musical genres possible with this versatile lineup. In this concert you will hear everything from the delicate orchestral sounds of Mozart’s Magic Flute and Grieg’s Holberg Suite, to the world of musical theatre with Kander’s stunning score from Chicago. There will be a chance to experience the full power of the saxophone choir in Bach’s Toccata, as well as the expressive individual voice of the baritone saxophone in the beautiful Prelude from Bach’s first Cello Suite. As well the more common soprano, alto, tenor and baritone saxophones, Equinox also features the tiny sopranino saxophone, and the powerful bass. The concert also includes the electronic ‘Aerophone’, played by Equinox director Alistair Parnell, one of the world’s leading proponents of the instrument, in an exciting virtuoso musical duel with Clare Tomsett-Rowe on violin in the famous ‘Czardas’ by Monti. The ability of the Equinox players to turn their hands to other instruments means there may be other surprises in store as the evening culminates in an exciting folk-jazz finale.